Locking input form fields, does it make sense? In certain views of our web-application, all information is usually presented as input fields as they can be modified. Now, because of our rights and roles system, for some people, several input fields would be locked because they have reading but not modifying rights. Is it appropriate to show this data as regular, read-only text, even if they, in a different scenario, like editing another person, would see editable inputs? Showing disabled input fields can be useful because it indicates to the user that there are additional options or that the information can be edited in different circumstances. If there is a benefit in your particular application for the user to know that this information is editable in a certain scenario (the correct role), then you could show them as locked. An additional message could also be displayed to explain why some fields are locked. 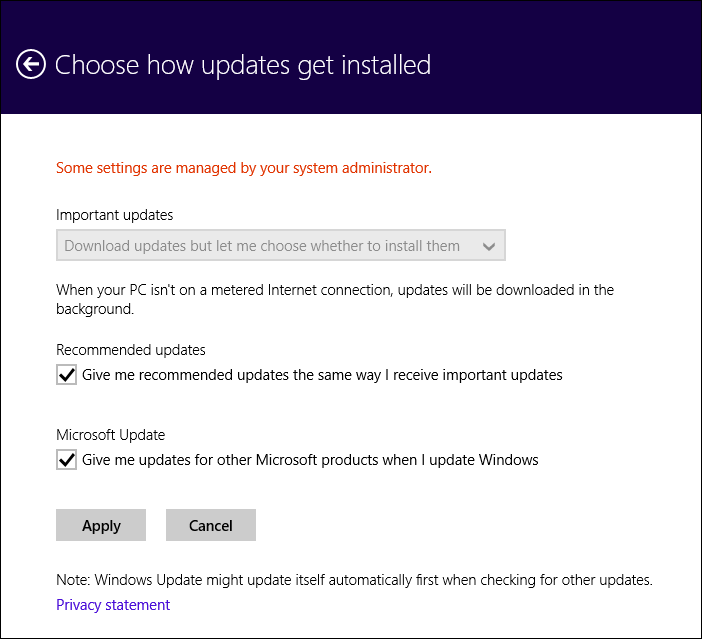 See Windows update settings example: This example shows that the Important Updates field can't be changed, but showing it as an input rather than plain text, means I am aware that this is in fact a setting not just informative, and the additional red message explains why this field is locked. I now know that if I want to get at this setting I need to track down my system administrator and ask permission from them. Simply locking them in field will be strange and could be harmful for users. Take the point of view of the user, not the system. "I can't edit some informations, alright, explain me why? So... why there is fields?" Showing locked information out of the field could be better, and of course, explaining why I can't edit them could much better. "If they can't edit this informations, do they need to see them ?" "Do they have any other way to edit them ? By contacting an admin for exemple? Would they be false information critical to the proper functioning of the service?" If the answer is yes , you should Provide Access to this other way or at least, explicit Explanations about it. How I see this situation: for some users, additional features are available. It is useful that you display the inputs for the others. You can display a message to highlight that more options are possible (if users really can change this and if you want to highlight this). Not the answer you're looking for? Browse other questions tagged forms input-fields or ask your own question. Should read-only text appear as plain text or in a read-only textbox? Should a form's style be left to the browser? When to remove labels for data elements?